Our PureBond® Idea Team Project gallery highlights do-it-yourself (DIY) projects made with our PureBond hardwood plywood that is manufactured exclusively by Columbia Forest Products. PureBond is perfect for DIY residential and commercial projects, which require the rich, warm look of natural wood. No matter the project, you’ll get a premium hardwood panel that was sustainably harvested and is always made eco-friendly with PureBond’s soy-based assembly technology with no added urea formaldehyde. PureBond plywood is made domestically in the U.S. and Canada. 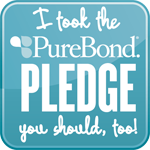 Want to try a DIY PureBond project of your own? Check out our free plans available for download by just clicking here.